Have Donald Trump and Jarryd Hayne ever been seen in the same room? Apart from the orange bouffant hair, the pursed lips and fake tan, the 45th President of the United States of America and the Gold Coast Titans fullback are eerily starting to sound like the same person. Just like Trump, Hayne doesn't let his performances do the talking any longer: he lets his Twitter account do it for him. A day after the Titans' uninspiring 32-18 loss to the Roosters at home on Saturday, Hayne whipped out his smart phone and took aim at a Fairfax Media report about him being fined for his poor attitude at training during the summer. He also labelled reporters as "grubs" and took aim at others for their "putrid, disgraceful journalism". Just to clarify, this was Hayne tweeting, not Trump. The relationship between Hayne and the media has been fraying for a year or so now. He took umbrage at one reporter claiming he'd already agreed to play for the Roosters when Hayne was still playing for the San Francisco 49ers in the NFL, and has been cranky with the media ever since. When Hayne signed with the Titans midway through last year, he declared the press was more about "selling newspapers" and no longer about "telling the truth". Hayne prefers to read less fictional publications, like the Bible. Of course, it's all good banter that keeps the rugby league world spinning. But Jarryd Hayne is not the media's problem. He's Neil Henry's problem. And it's already obvious, after just one round, that the problem is there. It's also clear that a power struggle is already at play between superstar player and coach and there's a whole graveyard of former Parramatta coaches out there smiling and nodding and telling Henry: "Welcome to the jungle, baby. Welcome to the jungle". Before Christmas, at the end of a week of pre-season training, the players decided they had failed to meet the standards they'd set for themselves, and agreed to have an additional session. This happens in footy all the time. 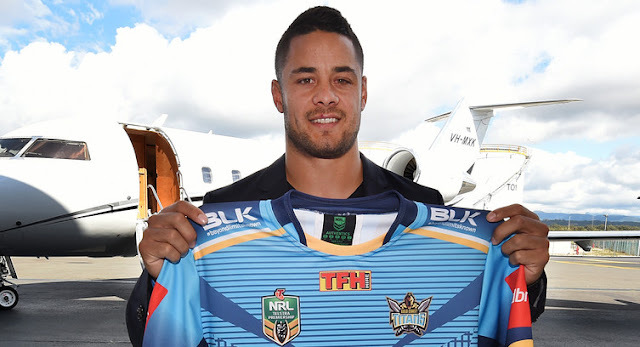 Hayne, though, wanted to fly to Sydney to have some treatment on an injury. The Titans could not confirm what the injury was. Why Hayne would require treatment in Sydney, only he knows. He has a coterie of people and professionals that he trusts implicitly and that's fine, but the fact he would go behind Henry's back and instead ask permission from one of the captains, either Ryan James or Kevin Proctor – again, the Titans could not confirm which one gave him approval – speaks volumes. Hayne's tweet on Sunday night calling out Henry for fining him is disrespectful to the coach. His tweet about "loose lips" is a barely veiled pointing-of-the-finger at his own club, coaching staff and teammates for leaking the story to the press. Hardly great for team harmony so early into the season. There's already a fear that Hayne's move to the Gold Coast will end like most Schoolies Weeks on the holiday strip – in tears. Midway through last year, Hayne signed a $2.4 million deal and was instantly declared by local media as the "God of the Gold Coast" who could generate millions of dollars for a club desperate to rebuild. When he kicked a match-winning field goal against the Wests Tigers soon after and stretched out his arms like Jesus on the cross, it seemed like a fitting description. But since that one moment of brilliance, Hayne has been a sideshow, from him hanging out with underworld figures to his declaration at the Auckland Nines that he may just join Ben Barba playing rugby in France next year instead of exercising an option to stay at the Titans. They cannot let it be undone by a player who really needs to shut up, put his phone away, and start reminding us why he is the best player in the game – when he decides he wants to be.